Serah Osiabu is a very conscientous woman when it comes to food preparation. While many succumb to Western styles of food preparation, Serah remains a woman of traditional significance. Being a woman who was brought up in a rural village and who prefers to be called ‘grass-roots’, Serah continues to uphold her traditional ways of doing things, particularly in food preparation, although she has lived most of her life in town. With years of experience as head of the Honiara Sup Sup Garden and the recent opening of her food outlet in Honiara, she could be looked up to as a champion of local food. Here experience in local food preparation, traditional basket weaving, gardening and biodiversity conservation has earned her international recognition. Recently, she was invited as an educator to the tenth annual conference of the Seed Savers Network in Brisbane, Australia, where, according to an Australian community newspaper, she stole the show. At the conference she was joined by Roselyn Kabu who works at the APACE office in Honiara. The two local women showed how to weave palm leaf baskets and other island craft besides outlining local gardening and biodiversity conservation projects in the Solomons. Serah sees her invitation to the conference as a chance to expose traditional ways of food preparation and gardening. While there, she did not hesitate to show to participants at the conference the Solomons way of doing things. 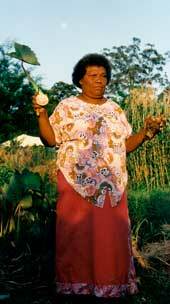 “Yes, I show them how to plant taro, yam and other local crops and how to prepare a delicious dish in a local way. “I teach them how to prepare a stone oven and the way to go about it to ensure that whatever food is placed in the oven is cooked,” she said. An APACE spokesman, who was one of the resource people at the conference, Russ Grayson, described Serah’s participation as “absolutely worthwhile. “A lot of Australians these days are planting crops like taro, yams and potatoes but they don’t know how to cook them. “Through Sereh’s presence and demonstration a lot of Australians who attended the conference have come to learn new methods of preparing those crops for a delicious meal”, said Mr Grayson who is currently in Honiara. Besides being an educator at the conference, Sereh said the trip was also a learning experience for her. About 150 people at the conference listened to speakers and took part in practical workshops on bush foods, Permaculture gardens, genetic engineering, working overseas in aid projects, vegetable cookery, seed saving and community gardens. While at the conference, Sereh and Roselyn also had the chance to visit community gardens.